This is an analysis and not a review per se. THERE ARE SPOILERS EVERYWHERE HERE so THIS IS A SPOILER ALERT! A SPOILER ALERT! DANGER, WIL ROBINSON! I recommend you watch the trailer, go see the film, then come back here if you’d like an interpretation or analysis. David once said to me, “I can’t wait until Dead Ringers opens so critics can tell me what it’s about.” – Jeremy Irons talking about David Cronenberg, 2013. A common thread I’ve seen among Canadian horror film directors is that they never assume that the audience is dumb. Many of them, like Cronenberg, are keenly attuned to the idea that there are untapped layers in the human brain; there’s a whole other film in the mind. Films like My Bloody Valentine, The Changeling, Cube, Dead of Night, and the seminal Black Christmas ***, are interpretable story allusions. 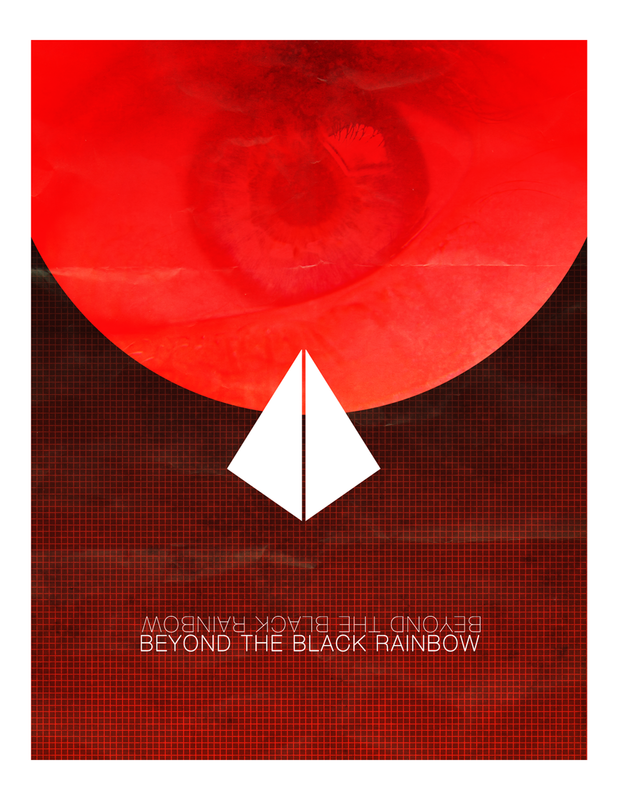 I watched Panos Cosmatos‘s Beyond The Black Rainbow this weekend at the TIFF Bell Lightbox. The first time I saw it was at home. I was on two hours of sleep and dozed off while watching it. I was intrigued, but tired and the great visual/musical combo was just right thing to sleep to. This last time I was on maybe three hours of sleep, but luckily still had enough caffeine to appreciate the film. And how. I’ll most likely watch it a few times, it was that good. I look at Arboria as kind of naïve. He had the best of intentions of wanting to expand human consciousness, but I think his ego got in the way of that and ultimately it turned into a poisonous, destructive thing. Because Arboria is trying to control consciousness and control the mind. There is a moment of truth in the film where the whole thing starts to disintegrate because it’s stops being about their humanity and becomes about an unattainable goal. The idea of letting your humanity suffer to achieve some unattainable goal…like making a movie [laughs]. That is the “Black Rainbow”: trying to achieve some kind of unattainable state that is ultimately, probably destructive. – Cosmatos, 2011. Let’s start with Mercurio Arborio. He’s an 80s new age visionary who uses a combination of benign therapies, pharmacology, herbal therapies, naturopathy, and neuropsychology to help humanity attain happiness and inner peace. In the commercial that starts the film, the Arboria Institute is described with phrases like “A New State of Mind: A New Way of Being,” and “A Practical Application of An Abstract Ideal.” The most telling of these is: “Born Of A Dream: To Create A Reality.” This one kind of stuck with me and I will talk about it in a bit. Mercurio Arboria’s name is an interesting new age-y made up entity. Mercury is a Greek god that can travel between the worlds of gods, human, and the dead. The word mercurial means flighty or constantly changing. Breaking down Arboria as a word, it brings to mind trees. My thoughts veer toward Dr. Arboria representing someone from the 80s new age movement. Luckily (or unluckily), I was born in 1973, and a lot of the visual and religious shopping aesthetic of the early 80s resonates strongly. These were the times when drugs and spirituality were mixed freely as a reaction against the political oppressive environment that surrounded the world back then. I grew up watching doomsday clocks and tv films like The Day After, that continually plugged the notion that the end was near. Constant mass anxiety is a means of control, ie. cold war era propaganda and sensationalism. In turn, some would experiment with religion the same way they would experiment with drugs to release themselves from that anxious reality. Aleister Crowley–Helena Blatvasky retro-inspired cults (Jim Jones) flourished in these sorts of environments. The new age movement provided alternatives to their already repressed lifestyle. Unbeknownst to them though, they were leaving institutions for other institutions wrapped up in esoteric terminologies. Harken back to the word Arboria = trees. This is an integral advertence to archaic religious and societal structures based on hierarchy. Deleuze explains in a very concise manner the difference between the dominant western thought idea of “the tree” and his rhizome concept by stating: “the tree imposes the verb ‘to be,’ but the fabric of rhizome is the conjunction ‘and…and…and…’” (Deleuze, 1987, p. 25). After the Arboria Institute advertisement (which have visuals reminiscent of Stan Brakhage’s Mothlight and Dog Star Man, much to my delight), we are given low-angle shots of Nyle. He looks dominating, meancing, and cold. He’s also the only one that interrogates Elena, the heroine of our story. Elena has special powers….or does she? Since the Arboria Institute experiments with drugs and spirituality which is “born of a dream to create a new reality,” I suspect here that there is way more than meets the eye. 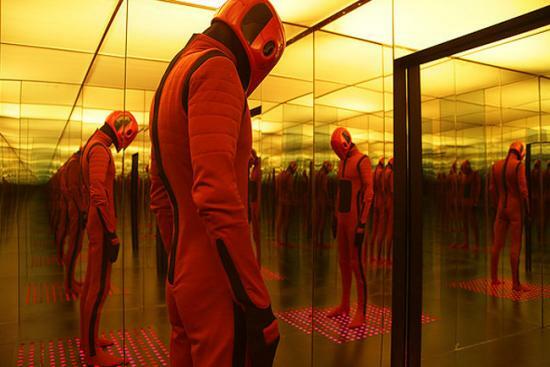 I posit that there are a multitude of ways interpreting Beyond the Black Rainbow, but one of the theories that sticks to me is that the otherworldly aesthetics and supernatural abilities seen are merely perceptions built upon drug fuelled visions of an actual truth. In a flashback, the audience is given clues to the Nyle’s true character. In 1966 (the heady days of drug experimentation and acid trips), Nyle is young, looks doe-eyed up at his teacher (Arboria), and gazes lovingly at Mrs. Arboria before his big transcendental drug trip. “Bring home the mother load, Barry,” Arboria says as Nyle goes into black pit (a black eye is drawn on his forehead, referencing the new age movement’s appropriation of the Hindu third eye). Somehow the journey turns sour. Images of Nyle’s face burning and being melted away in lava lamp like sequences fade in and out of the screen. Whatever good facade Nyle has had up is stripped away and obliterated. As Nyle emerges from the pit, an overhead shot reveals the black liquid pool as the iris of a giant eye. Out of the spiritual realm, Nyle comes out a psychopath and inexplicably kills Mrs. Arboria. Soon after, Elena is born, her mother’s death, Dr. Arboria says, shall “not be in vain.” “Let the new age of enlightenment begin,” he proclaims as a masked Nyle quietly looks on. There is nothing but menacingly masochistic dominance left in Nyle. He must wear a false veneer with a wig and contacts, for his true face is monstrous. Every scene has him either orgasmically high on control or holding back a constant disgust for others. As he goes in to visit a highly sedated and senile Dr. Arboria, he rolls his eyes at his textbook new age phrases. Only a hint of the old Nyle comes out in a regretful glance at his mentor while injecting him with a fatal drug overdose. Throughout the film Nyle pops drugs into his system and in one scene, even smiles at his reflection after downing several of them. His supposed control is artificial. His alienation/alien-ness is an alternative reality concocted from a continual hallucinogenic state. As he picks up the phone he hears static combined with radio white noise. There’s a robotic voice somewhere in there, but it sounds more like someone changing radio channels. While no actual words are discerned, Nyle perceives a conversation that elevates his paranoid state, possibly triggering the deadly events that are soon to follow. Elena, in turn, kills Margo with her brain and talks to Nyle telepathically. But does she really? Cosmatos has presented us with a trance film, therefore putting us in a trance-like state (hence the overly long pacing and the slow moving characters. I will also point out that there are such things such as hallucinogen videos that exist. If they actually work, I do not know.). The camera becomes an unreliable narrator giving us hints of real vs unreal worlds through Nyle’s or Elena’s perspectives. When Elena moves, it’s unstable and slow, and since she’s been drugged all of her life, it makes perfect sense. However, her view of reality can possibly be skewed in such a state. As she escapes her jail, she travels from weird room to another weird room, encounters a mutant, and a Sentionaut, and finally comes face to face with the unmasked Nyle. As Nyle pleads to Elena, his foot catches on a branch and he falls, hitting his head on a rock and dies. Elena might also assume she has pushed Nyle telekinetically, because she smiles, and a great sense of relief comes over her face at that moment. This, however, is questionable. I first thought that Nyle’s death was abrupt considering the time it took to get to that point in the film, but if you think of it as something that occurs outside of their mutual drug fueled states, it makes the death far more meaningful. Another possible theory I’ve been parsing in my head is one of the film as a story continually played out by a comatose Elena, (This is where I release my feminist slash philosophical view on the film). Elena is a young girl in a coma. She’s probably been there since before adolescence, maybe placed there due to a car crash (Nyle drives with purpose on long roads with no traffic), where her father was driving in a drug induced haze. Her mother dies and she survives only to end up in the coma. Dr. Arboria and Dr. Nyle are the same person: her father (a young drugged sinister figure and an old weak one that eventually succumbs to his addictions). Perhaps her father was a scientist who dabbled with drugs and, in turn, a comatose Elena creates this dark Elena in Wonderland world. An infinite world of possibilities can occur in Elena’s mind due to the ever evolving world of the subconscious. In the “interrogation room,” hospital/video game-like noises occur every time Dr. Nyle makes a provocative statement at Elena. She might recall video games or the unique sounds of a modem (ie. the noises in Nyle’s telephone). 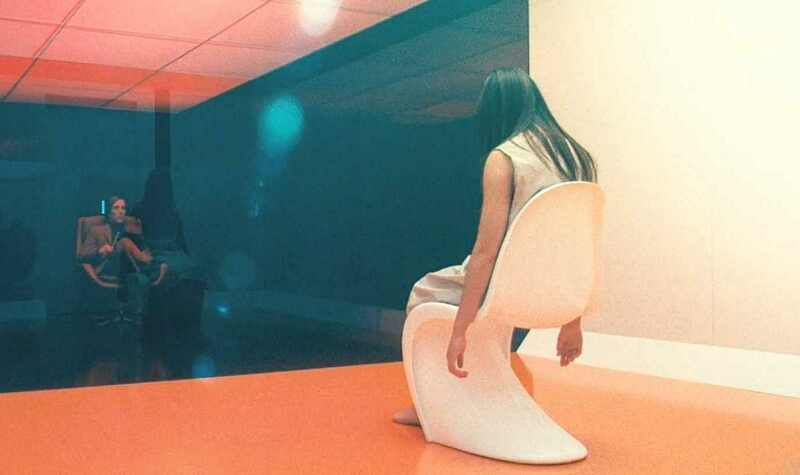 The mise en scene is a sampler from various 60s-80s movies aesthetics: Kubrick’s 2001 (interrogation rooms and flashing buttons); Trumbull’s Silent Running (the domed indoor gardens); Cronenberg’s early works (dispassionate tone and repressed scientist); and Lucas’s THX-1138 (the hallways and Sentionaut). I’m sure there are more references, particularly towards the end when we stumble upon two heavy metal drunks in the field (one of them being Chris Gauthier who’s in John Carpenter’s “Cigarette Burns” from the Masters of Horror Series – the mutant on the floor we see in the middle of the film is similar to the imprisoned angel in that episode). That scene could have been plucked from a variety of horror movie tropes. My point being that these are scenes and settings out of film driven archetypes. Elena could either have been exposed to them as a child before her coma or subconsciously in her hospital room while in her coma. Furthermore, we continually see Elena in a hospital room-like bed in a white surgical gown. She is immaculately kept, but there’s no bathroom in sight. The only thing in her room besides her bed are the tiny televisions that change channels on their own, or we can believe that she changes the channels with her mind, (Note: in the channels shown, one of them shows a karate tournament, another shows a police chase, and the last one is a cartoon man being pulled apart. At the end of the cartoon man’s story, a wolf comes out of nowhere, transforms him into a medicine bottle, swallowing him whole. These can also be images she uses in empowering herself in her eventual escape). Nyle represents the male imposition of desire on a young woman who is “coming of age” ( I loathe those terms because they are generalizations, but they fit this theory to describe this phase in Elena’s life). The only figures she can emulate or have archetypes for, are male (with the exception of the very stoic nurse and a perceived “soft dead mother” trope). Her father is absent and the only male she truly encounters is the psychopathic Nyle who’s obsessed with her and her “abilities.” Nyle can be a collection of male voices (doctors, father figures, sounds from her hospital television). Elena envisions a world made up of those media driven voices without the context, discerning a reality that can be ultimately terrifying to a girl. Keep in mind that Elena in a coma is extremely vulnerable, naive, and scared of the world outside of her head, especially if she’s going through puberty at the same time. For all we know, she’s only been exposed to a fake corporeality via drugs or the television in her room. Turn on the tv for any length of time and close your eyes. Imagine fashioning a reality or a dream state with the visuals that come to mind from the audio you hear. Then try to parse that through the mind of a teenage girl reaching womanhood. I’m sorry, but when I was in that phase, it was chaotic, confusing, and extraordinarily hard to navigate the real world in that sort of environment.The Sentionaut is revealed to have a childlike face with a perpetual catatonic expression, maybe representative of Elena’s frozen age existence. It is perceived to assist her and aiding her in her release from that phase. That mirror shot with the multitudes of Sentionauts is both an aesthetically pleasing scene of assuredness in Elena’s visions. Mirror images are a way that her 2-D experienced mine can parse the 3-D world, thus alluding to her creation of various dualities (there are two Nyles- the masked controlling villain and the unmasked unhinged villain; there are two Elenas – the one that is still asleep and the one that awaken; there are two mothers – the dead mother and the passive and fragile Mrs. Rosemary Nyle –rosemary the herb is a symbol of remembrance, love, and loyalty). 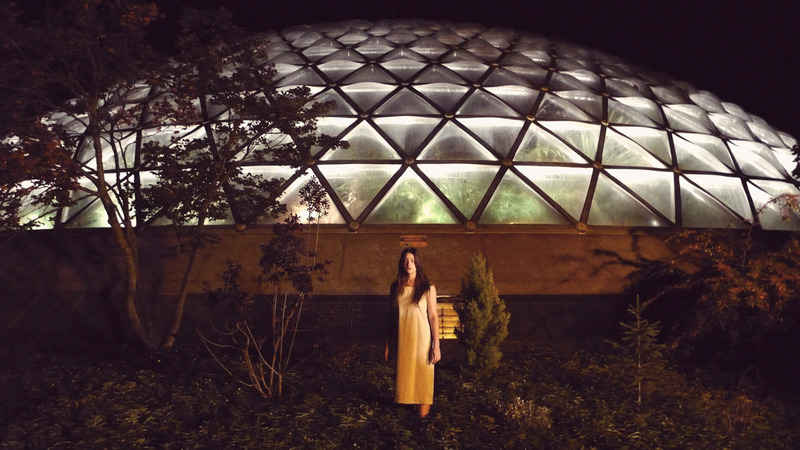 Elena’s slow movements imply her moving through sluggish dreams. As she ventures out from room to room, she marvels at her surroundings, seemingly knowing where she is supposed to go. As she reaches the “outside” her sensory perceptions peak. Elena smiles as her feet hit the soft ground and her eyes marvel at the starry world above her. Sensual and climatic in expression, her reaction comes from a newfound experience of the true present. Meanwhile, Nyle (like many horror movie villains of the 80s can only kill if the heroine’s virginity is threatened.”You fucked her,” Nyle accuses the drunk before he kills him in classic horror movie fashion (of note here is the excessive spraying of blood; a sensational body horror tactic from the 70s). Skipping to Nyle again at the moment, while it’s still fresh in my brain: the leather suit he puts on is made by a company called Noriega Leathers. Now with references to Ronald Reagan and the famous Panamanian dictator, Manuel Noriega, one can posit that these are things she most likely would have heard in her hospital room. The weapon Nyle uses is called the Devil’s Teardrop. Keeping in mind that there are a ton of videotapes in Dr. Arboria’s room, and he watches a lot of nature shows. The last scene we see him in, he’s watches a documentary on Molokai which is an island created out of ancient volcanoes. Obsidian is a naturally occurring volcanic glass formed as an extrusive igneous rock. The devil’s teardrop is also a nickname for obsidian. Elena could have put the two facts together out of the nature shows her father watches in her room. Is someone trying to wake Elena up? Does she relive an escape every day? Is the Sentionaut a combined archetype of the action figure craze of the 70s and 80s? By Dr. Arboria’s attempt to bring a new state of mind and a new state of being beyond the tree-like hierarchy that the 80s future world follows, his alternative solution is built upon a rhizome-like artifice. It ironically ends up being the same tree-like tower (hello controlling prism), with the same oedipal structured branches. Elena can never truly escape the maze and her stories until she wakes up to her true reality. ** I’m a bit of a Bob Clark fan. I think his reputation for directing A Christmas Story and Porky’s largely overshadows his work in creating one of the foundations to modern slasher film, which was Black Christmas. He’s both an underrated director and BC is an underrated film, (and, admittedly, he also made forgettable movies as well). * Too many times I found myself typing out Nye (as in Bill Nye the Science Guy) instead of Nyle. * Barry Nyle’s pills are from Benway’s Pharmacy. Dr. Benway is a recurring character in the works of William S. Burroughs. Cosmatos partly picked up these themes (the ones of control) by reading the science fiction works of Beat novellist William S. Burroughs, books by and large dealing with societal control. Thanks for the analysis. It helped me understand some things that I had found to be unclear. I just recently discovered this movie and have watched it multiple times throughout this week. I also watched it while reading your words and ideas, which actually had the effect of enhancing the experience. Anyhow, did you also notice that Dr. Arboria at the end of the year 1966 scene seemed to be dipping baby Elena into “the black liquid pool?” I think this is very significant. Any excuse for me to watch it again! I have to pay attention to that. Thanks for reading!